Abstract: This article reviews beer production, consumption and the industrial organization of breweries throughout history. 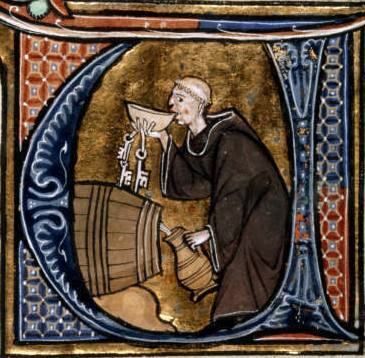 Monasteries were the centers of the beer economy in the early Middle Ages. Innovation and increased demand later induced the growth of commercial breweries. Globalization and scientific discoveries transformed the beer industry and increased competition from the 16th through the 19th century. The 20th century was characterized by dramatic (domestic and international) consolidation, major shifts in consumption patterns, and the re-emergence of small breweries. Excerpt: With the spread of his Holy Roman Empire around 800 AD, Charlemagne built many monasteries across Europe, many of which became centres of brewing. Initially, most of the monasteries were located in Southern Europe, where the climate permitted the monks to grow grapes and make wine for themselves and their guests. However, when later monasteries were established in Northern regions of Europe, where the cooler climate made it easier to grow barley instead of grapes, the monks started to brew beer instead of wine. Throughout the early Middle Ages ‘monastic brewing ’ spread to the British Isles, Germany, Scandinavia and the Low Countries. Only in the twelfth and thirteenth centuries would brewing emerge as a commercial venture. Before that, the monastery was the only institution where beers were manufactured on anything like a commercial scale. Initially, beer brewed by the monks was used for their own consumption as well as to give to guests, pilgrims and the poor. Later, monks started to brew beer for other people as well, such as noblemen and to sell their brew in so-called ‘monastery pubs’. There were also so-called ‘church ales’ that were celebrations and feasts of the church where the peasants were allowed to drink beer for free, reducing the demand for commercial brewing. Studies indicate that monks often drank large quantities of beer. Statistical sources even mention beer consumption of up to five liters a day for each monk in some monasteries. Several factors seem to have played a role. First, as the water in the Middle Ages was often polluted, beer was healthier than water. Second, apart from nutritional reasons, beer was often used in monasteries for spiritual and medicinal purposes. Third, an average meal in the monasteries of the early Middle Ages was rather frugal, and beer provided a welcome nutritious addition. Fourth, although beer contained alcohol, it was seen as a liquid like water, and was, as such, not forbidden during a fasting period. Beer was the ‘ubiquitous social lubricant’ and this not only because it was an essential part of the – often dire – medieval diet, but also because during the Middle Ages ‘every occasion that was even remotely ‘social’ called for a drink’.